KRASNAYA, POLYANA RUSSIA - With 2.5 km still to ski, Martin Fourcade was feeling so strong he started celebrating his first Olympic gold medal. Having hit all five targets in his final round of shooting, the Frenchman stretched his arm in the air and pumped his fist. Minutes later, Fourcade crossed the finish line at a leisurely pace to confirm what he already knew — he had won gold in the men’s 12.5K pursuit at the Sochi Olympics. 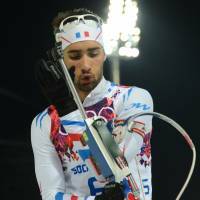 Fourcade’s friend and teammate, Jean Guillaume Beatrix, earned bronze, and both put France onto the medals table at the Sochi Games. 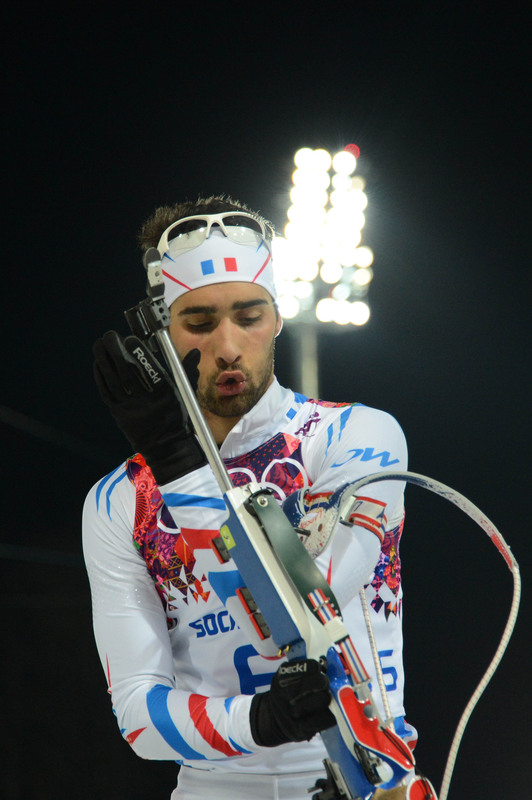 Fourcade missed one target in the standing shooting portion of the race, which he finished in 33 minutes, 48.6 seconds. Ondrej Moravec of Czech Republic finished 14.1 seconds later to take silver, and Beatrix was 24.2 seconds behind Fourcade in third. Fourcade embraced Beatrix in the finish area, but the bronze medalist was so overwhelmed that, shortly afterward, he already forgot what his friend had said to him. Moravec surprised himself by winning the second biathlon medal for the Czech team after Jaroslav Soukup took bronze Saturday. Norway’s Ole Einar Bjoerndalen was fourth, missing out by 1.7 seconds on what would have been a record 13th Winter Olympics medal. Bouncing back from a disappointing performance in the first biathlon event of the games, the 10-kilometer sprint that set the starting positions for Monday’s pursuit, Fourcade dominated the second half of the race. The gold is Fourcade’s second Olympic medal; he won silver in the mass start event in Vancouver. The Frenchman also holds five world titles, including two in the pursuit discipline. The victory confirmed Fourcade’s dominant season. He has won four World Cup events and leads the overall standings by 121 points over Norwegian rival Emil Hegle Svendsen.